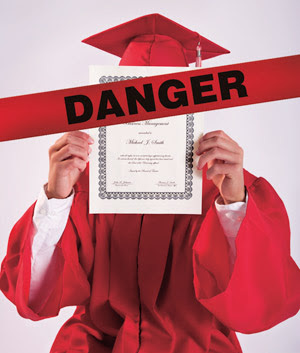 Chaz's School Daze: DOE ContinuesTo Award Bogus High School Diplomas. It took this long for this state to complete the audit? Wow, the ridiculous amount of bureaucracy. The length of time it took for this audit to be completed was a waste of resources and money; it was never a priority. It's also useless since it shows everything we already know, and will do nothing to punish those accountable, therefore it's time to let this go. The principal was fired thanks to the teachers, and it's the DOE's fault for not holding any of those imbeciles responsible to the point where they could've set a citywide example that set administrators in other grade-fixing schools in their place. The DOE should have also held all those students back until they graduated the right way. Thankfully, Dewey now is a much different school with thousands of students applying every year and moving on up with every year. As one of the last remaining large comprehensive high schools in the city, we need to preserve schools like Dewey. Who knows for how much longer the traditional, comprehensive public school model will survive at the rate this country is going in. However, Dewey's story shows how it's not the kids, but the people leading such kids that makes or breaks a school. Oh boy, look with an 80 percent graduation rate and only a 40 percent college readiness rate - it does not take a genius to figure out something is going on. We have to pass all students. Two weeks ago I was called into a meeting with the principal and the superintendent for passing a student who died in October. I told them the truth. "Had he been in my class till Jan - he would have passed with an 85. I could not give him an 85 because he did not show up past Oct 15th." They both thanked me and admired how I always look out for kids. Pre-Bloomberg the graduation rate was 50 percent with 100 percent of the grads college ready. That probably still would be the real graduation rate today. However, public schools now have to compete with charters and the media constantly beating them up. In other words cheat, do credit recovery and anything else that will get kids to graduate. The NYS Education Department willingly participates in the lowering of standards in the scoring of all three levels of Math Regents. Their conversion charts consider the accumulation of somewhere in the neighborhood of 1/3 the possible points as being worthy of a passing score of 65. Is it any wonder why so many graduates of NYC high schools are unprepared to take college-level Math? Actually this is going on with every high school in New York City. Some are not as blatant as this one, but a “rose” just the same. Dewey got caught, that’s all. The others will have other continents to get away with it or get caught up with eventually. You are now doing the same thing the Post and Daily News reporters do by placing salaries into your articles. Leave that trash out. Nobody should care how much the principal or teacher make. At the end of the day our salaries compared to private industry is something private industry laughs at. Why are you now doing this? Unions already have a hard time negotiating and getting us 1 or 2 percent. You are better than that. I honestly can't blame and won't blame any principal or teacher who cheat. I won't do it. I thank God I do not have to and I am not in that predicament. However, if I had to I would cheat and play the game like anyone else. Why? Because this is a DOE system issue. This is not 1 principal. This is well over 1500 principals. This is not 1 teacher. This is well over 75,000 teachers. This is coming from Carmen and before her were Walcott, Black and Klein. I think it is funny this principal survived and commend her. Plus, she is now helping other principals and teachers to cheat. Win-win situation for DOE. The real focus is the DOE allows this. Look at Clinton. Teachers spoke out and principal got caught red-handed. He was removed. Now, the DOE is removing all staff. They must interview for their jobs. New principal is doing the same as the old one. One of the APs in Clinton is placing every student into credit recovery and changing grades. He brought her into Clinton just to change grades. This is just the tip of the iceberg. What about all the schools that mandate that only 25% or 30% of the grade can be based on tests and quizzes? It basically guarantees a 70 for anyone who manages to show up. My school has a 97% grad rate, 5 buckets for scoring, quizzes are 20%, and we cant give a grade less than 45 on a test even if they get a zero on a test. Well, they all get to that 65 on a report card. I knew Kathleen Elvin when she was a teacher at Asa Philip Randolph. She was not such a great teacher and the kids didn't like her. Also, she failed a lot of kids, so her behavior as principal forcing teachers to pass kids is laughable and hypocritical. I noticed that most teachers who go into administration were not so good in the classroom and that administration is an out from the classroom. everyone needs to sign this and get a few coworkers, friends and family to sign too. IF we cant even get 300 teachers to sign a petition, we are so freaking done. Teachers complain and complain and complain but no one does anything. Pathetic! Sign the damn petition. Post it, get people to sign it. Somebody please investigate my Principal, Namita Dwarka of Bryant HS. She forces us to give out diplomas like candy. As long as it's all about the ratings, it will continue. One school I was in said any teacher who fails a student will get a file letter. We had 100 percent passing until the DOE promoted the principal. The next year the school dropped to 50 percent passing and the new principal got removed to a borough center. The third principal told the staff "look please do not fail any student" and I heard the passing rate went back up to 90 percent. Passing and failing students is subjective and very similar to rating teachers and rating schools. Education is now all subjective. @ 2:22 What does this sentence mean: "I noticed that most teachers who go into administration were not so good in the classroom and that administration is an out from the classroom." Especially "and that administration is an out from the classroom." What subject are you possibly teaching? And Principals like Dwarka gets exonerated for grade changing. It is a system whose only mission is to push experienced teachers out, and replace them with newbies. Yes, many failed/burnt out teachers do move up into admin level jobs. Not all are like that, of course, but in my own experience, it is a majority. In NYC it is easy for a motivated 2-3 year untenured teacher to get an AP job. Go to the Leadership Academy, College of Saint Rose or online programs and voila! You are licensed! I personally worked for a principal who had three years teaching experience in a resource room and went into the Academy and was given the school I worked in for several years. He ran the school into the ground and eventually moved on to a charter school. Where I am at now, a known 'failed' teacher from a large Queens HS is now our AP, and he is in over his head. Like I said, not all are like that, but enough of them are to make you think about the rot at the core of our educational structures now. Awesome comment by 11:10 ! The grades are as phony as a three dollar bill at worst and as valuable as the old Itlalian Lira was before the EU ! Everyone is protecting her, nobody knows why?